Whale Evolution – A Whale of A Tale! I am a member of a proud minority group in America, a group who’s numbers aren’t what they used to be. Not the 40-50% who believe in creationism, no I am one of those pesky people who still believes in evolution (roughly 40% of Americans). Let me clarify those statistics and draw attention to a major point, only 40% of Americans still believe in evolution and a majority of Americans now support creationism or evolution guided by a Supreme Being (implied God, but interfaith). I have nothing wrong with creationism or those who believe in it, I also have no qualms with those who feel evolution can be guided by a Supreme Being. I fully believe that evolution and creationism can be compatible, and while I do not personally believe in the Christian God as normally conceptualized, I do recognize some sort of higher power. My higher power is Serendipity; positive random chance which often leads one to unexpected and unforeseen outcomes beyond conscious reckoning. You can see evidence of Serendipity in quantum entanglement, which can be described as “a physical interconnection among particles, despite spatial separation.” Just like Serendipity can bring two people unexpectedly together to become new friends on a chance meeting, so does entanglement bind disparate particles together coaxing them to move in unison. Entanglement has also been shown to play a role in evolution, bringing us back to the topic of this blog. The whole metaphysics discussion may seem out of place but I feel it is very relevant to any discussion of evolution given the controversy between the two, one that borders on being a blood feud. Charles Darwin, generally thought of as the founding father of modern evolution theory, was raised and lived as a Christian much of his life. Three years before his death, Darwin is quoted as writing, “agnostic would be the most correct description of my state of mind.” Darwin got a lot of things right, like natural selection and his finches. Somethings he was very wrong about, like whales. You will need a National Geographic account to view that link, they’re free and totally worth it. People thought that idea was ridiculous even in Darwin’s time, and as it turns out it is also completely wrong. In the 1980’s, evidence surfaced showing the real ancestors of modern whales. Ambulocetus was an ambush predator that could weight over half a ton and looked like a furry crocodile, and is one of the missing links in the evolution of whales. Whales were a species who left the water eons ago, came to land and became hippo-like creatures. At this point some stayed on land enough to remain hippo-like and became hippos, others preferred the life aquatic and became whales with legs. 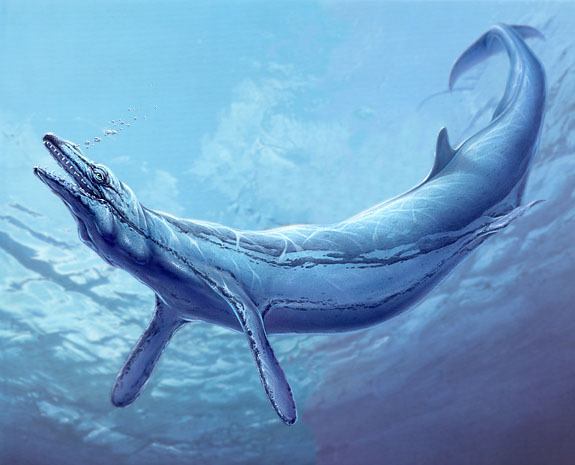 Basilosaurus, terror of the seven seas. These fossils were coming from a remote valley in Egypt called Wadi Hitan. While fossils had been excavated from this location since the turn of the 20th century it remained remote and overlooked until new technologies in the 80’s made it more accessible. It was then that the first whales with legs began to be discovered. They include many species and span many millions of years of evolution, from the hippo-like through various incarnations until they were finally whales.